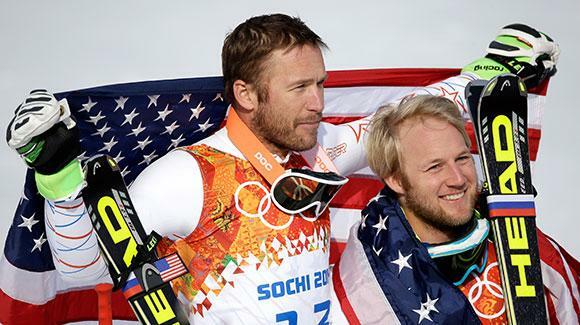 Bode Miller, left, and Andrew Weibrecht celebrate their bronze and silver super-G medals on Sunday (USSA photo). And just like that the U.S. Ski Team’s alpine squad is on track to have one of its most successful Winter Olympics in history. Lake Placid’s Andrew Weibrecht, already a bronze medalist in super-G at Vancouver in 2010, started 29th and finished second to Norway’s Kjetil Jansrud Sunday in the men’s super-G at the 2014 Sochi Winter Olympics. Weibrecht, 28, has struggled mightily with injuries on the World Cup circuit, never posting a win, but he’s now a two-time Olympic medalist. Teammate Bode Miller is now a six-time Olympic medalist after tying Canada’s Jan Hudec for bronze Sunday. A shoulder injury right after his bronze-medal win in 2010 has plagued Weibrecht for years, and to date his best World Cup results were two 10th-place finishes in 2007 and 2011 at Beaver Creek. Weibrecht, in fact, lost his U.S. Ski Team funding in the wake of so many poor results following his 2010 injury. Miller was just ahead of Weibrecht with a silver in super-G at the Vancouver Games in 2010. The gold medalist from those Olympics, Norway’s Aksel Lund Svindal, finished seventh on Sunday. But Jansrud on Sunday continued Norway’s dominance of Olympic super-G with a time of 1 minute, 18.14 seconds. Miller and Hudec were seemingly tied for silver at 1:18.67, a little over a half a second behind Jansrud, when Weibrecht once again stunned the world with a second-place time of 1:18.44. Norwegians have now won the last four Olympic super-G races and five of eight since the event was added to the slate at the 1988 Calgary Winter Olympics. Kjetil Andre Aamodt, the all-time record holder with eight Olympic medals, won the super-G three times. Miller, 36, became the oldest Olympic medal winner in alpine skiing with his first podium of these games, topping Aamodt’s record win in 2006 at age 34. Nine different American men historically have won 17 Olympic medals in alpine skiing, and Miller can claim more than a third of those medals with six dating back to 2002 Salt Lake City. Miller tied speed skater Bonnie Blair for second all-time among American Olympians with six medals and now trails only speed skater Apolo Anton Ohno’s eight. “I’ve never been stuck on counting medals,” said Miller, who missed all of last season after a knee injury sustained at the Rosa Kbutor test event in 2012. “But I’ve put in a lot of work. This was a really hard year with a lot of effort coming back to get fit and get ready and just battle through everything life throws at you. Ted Ligety, the defending world champion in super-G, made a critical error and finished a distant 14th on Sunday. A day after Sochi was widely declared a bust for the U.S. alpine skiers halfway through the 10 medal events, Americans now have three medals, which is tied for their fifth best total ever (1960 Squaw Valley). The next best totals came in 1964 Innsbruck (four medals, no gold) and 1994 Lillehammer (four medals, two gold). Giant slalom favorite Ligety and slalom favorite Mikaela Shiffrin, of Eagle-Vail, give the U.S. a realistic shot this week at tying the 1984 Sarajevo Olympic team for the second best American medal haul ever (five total, three gold). The record of eight medals (two gold) at the Vancouver Games still seems like a long shot with just four technical (giant slalom and slalom) events remaining. But don’t count out Miller — the only American man to ever medal in GS with a silver at Salt Lake City in 2002 – or Julia Mancuso, the 2006 gold medalist in GS at the Torino Games. Mancuso holds the American women’s record with four career Olympic medals, including bronze in the super combined last week. Still no American man has won more than one Olympic gold medal in alpine skiing. Ligety, the gold medalist in combined at the 2006 Torino Games, or Miller — who won his only gold in super combined at Vancouver — could change that with a win in the GS on Wednesday. There’s a very short list of American men with at least two Olympic medals: Phil Mahre (slalom silver, gold), Tommy Moe (downhill gold, super-G silver), Miller (one gold, three silver, two bronze in every discipline except slalom) and now Weibrecht (super-G silver, bronze).